Quick update midafternoon on the 31st: If you look at the Halawai event list and find yourself torn between the screening of "Hawaiian: The Legend of Eddie Aikau" and the event with Hokule'a navigators at the American Museum of Natural History, here's a way you can sort of do both - there's a screening of the film at Videology in Williamsburg tomorrow night, June 1. Eddie's brother won't be there, but there will be a silent auction and a raffle and all proceeds will go to support the Hokule'a, which was so important to Eddie. Details and tickets here. Done with a very good visit to Washington, D.C., where they were hosted by the venerable Washington Canoe Club (est. 1904), received a message in a bottle from John Kerry, which they'll deliver to the UN on June 8th, World Oceans Day, honored King Kamehameha I with a lei draping ceremony for his statue, and doubtless inspired hundreds of school kids (because that is how they do! 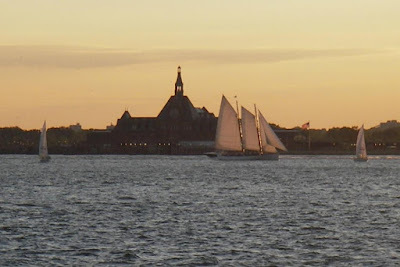 ), Hokule'a travels on towards us here in NYC, where preparations are nearing completion, the welcome ceremony has been being practiced, lei are being strung, and all of us who have connections with Hawai'i are getting very excited. 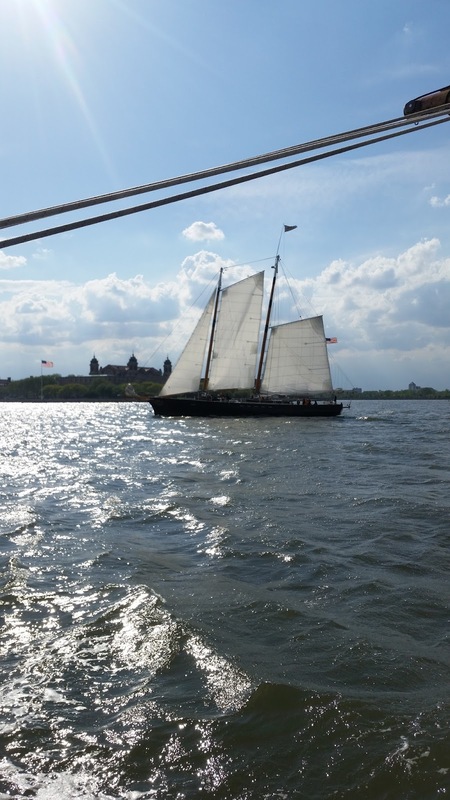 This weekend, Hokule'a arrived in Cape May, New Jersey - click here for the crew update from there. There's a whole string of public events while the Hōkūleʻa is visiting; somebody at Halawai has done a terrific job of keeping up with the events as they are announced, click here to see everything that's going on! Unfortunately, the giant human-powered boat welcome flotilla in which I'd hoped to participate had to be let go of, as major paddling events require a good bit of advance planning and there just wasn't any way to get the level of details we would've needed to get the appropriate permits at the time we would've needed it - however, you lucky paddlers and rowers who keep your boats in the Upper Harbor, North River stretch of the Hudson, and the East River, she'll be here and there in your home waters from the 5th to the 18th - keep an eye out for her, and you can follow her activities at Hokulea.com. I'm looking forward to a very, very special two weeks! 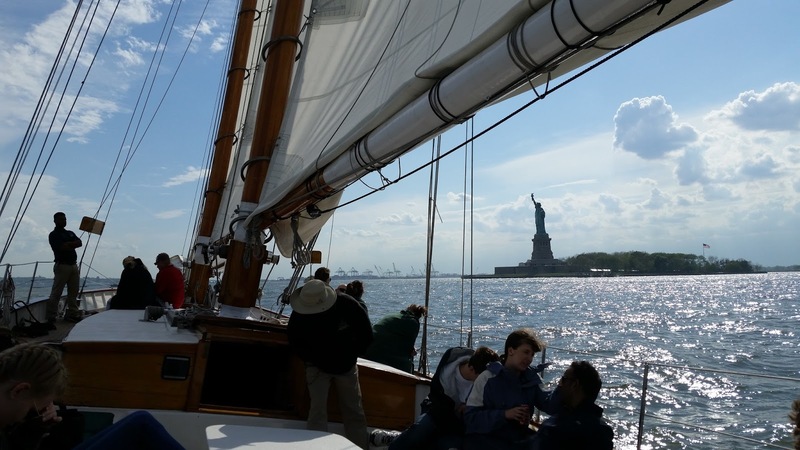 Out For A Sail on the Schooner Adirondack! I'd hoped to finish off weekend-before-last-Sunday's fun, we did something cool after the conservatory garden, but that one I actually want to write a little something about, and work hasn't really been cooperating with leaving me enough time and energy to do that, so instead, here are some nice pictures from Saturday the 14th when TQ and I went on a boat (I'm on a boat!). 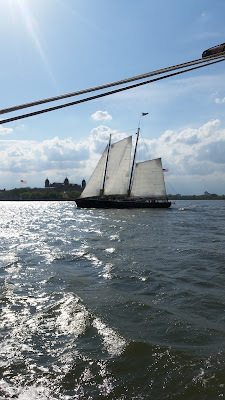 I'm under doctor's orders not to paddle until the end of May, but there's no trouble in going out for a ride on a nice schooner, so we did. It was a gorgeous day, Capt. Kat was driving, it was great to catch up with her, and we had an absolutely splendid sail. 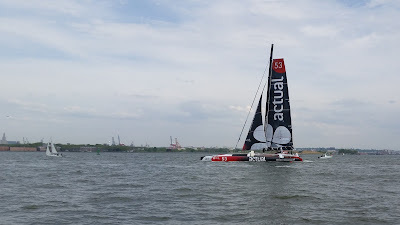 We got a special treat in that the Transat Bakerly race fleet was beginning to arrive, and the first arrivals were slated to have some exhibition racing off the Battery; we were a little too early for the actual racing (the next Adirondack sail was going to have a great show!) but we did get to see some of the giant multihulls prowling about the Upper Harbor, which was very cool. I'd forgotten to put a card in my camera, but TQ had his phone along so we took turns with that; some of these are mine, some are his. We splurged on steak at the Knickerbocker Grill in the Village afterwards and all in all it was just a spectacular day! OK - I just can't resist a little plug here - I admit to being horribly biased (I'm still proud to have been part-time crew on the Adirondack for 5 seasons, loved it! ), but seriously, if you're looking for the pleasantest possible way to take a trip out on the harbor, whether you're a visitor yourself, or a lcoal looking for something fun and a little out-of-the-ordinary to do with out-of-town guests, you just can't beat Classic Harbor Lines. Hokule'a is gradually working her way up the east coast of the U.S., and guess where she is today through next week? Click here for a hint! Here's a DC event list that was shared on the Hokule'a Crew facebook page - please note that although most of these are over the next few days, the last one goes on even after the wa'a has cast off and resumed her travels. 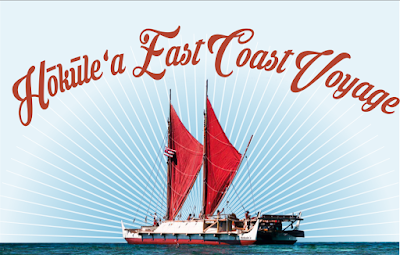 Visit the Hokule's Crew FB page (link in prior paragraph) or Hokulea.com for more information about the voyage. Hōkūleʻa’s navigators will talk about traditional wayfinding, navigating across the deep sea using the stars, waves, birds and other signs of nature. The public is welcome to come aboard the Hōkūleʻa and meet the crewmembers who will share the history of the legendary canoe and the mission of the Mālama Honua Worldwide Voyage. During the May 20 and May 21 outreach, crewmembers and the public will be invited to help with a BioBlitz activity focusing on plankton. A BioBlitz is an event that focuses on finding and identifying as many species as possible in a specific area over a short period of time. At a BioBlitz, scientists, families, students, teachers, and other community members work together to get an overall count of the plants, animals, fungi, and other organisms that live in a place. May 20 and May 21 mark the National Geographic Bioblitz event dates, in partnership with National Parks Service. Hōkūleʻa crewmembers will conduct a plankton tow activity, adding plankton photos to the C&O National Park BioBlitz data. Throughout the month of May, NMAI will be focusing on Hōkūleʻa’s visit with a film series and weekend festival that will celebrate traditional Polynesian wayfinding, as revived and practiced by the Polynesian Voyaging Society. The month of events will culminate with the Mālama Honua: Hōkūleʻa Worldwide Voyage Celebration, a weekend-long festival taking place on Saturday, May 28, and Sunday, May 29, from 10 am to 5 pm each day. The program will be an opportunity to to meet the navigators and crew from the voyage, enjoy music by Robert Cazimero and Halau Na Kamalei, and to experience a special “pop up” planetarium collaboration with the ʻImiloa’s Astronomy Center and other hands-on activities. For full detail’s on NMAI’s Hawaii program series, click here. 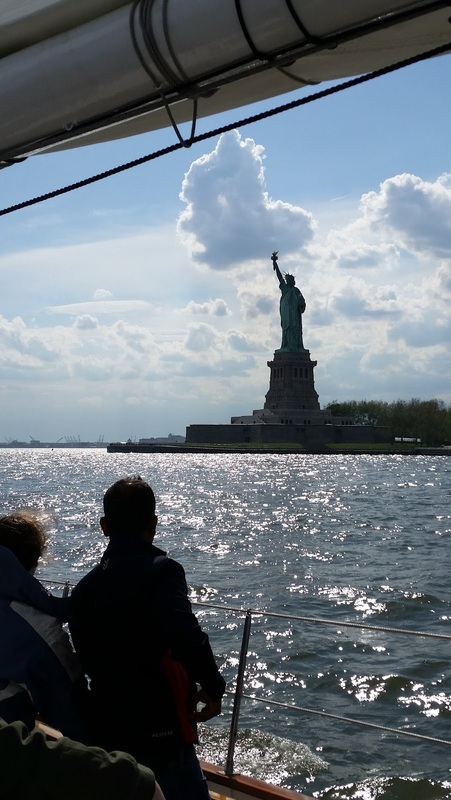 For updates on the NYC visit, keep an eye on the Halawai website. More from the Conservatory Garden in Central Park. I'm off the water for a month here, so taking advantage of that to squeeze in a little dry-land sightseeing. I used to live on East 91st and 1st and this was always a nice place to visit; somehow it had come up when my friend Mandy and I had gone to the Metropolitan Museum of Art over the winter, and I'd suggested that a garden/Cooper Hewitt combination would make for a nice day. Unfortunately we missed the tulips at the north end of the garden, I'd been hoping to see those because TQ had helped plant them during a gardening class he'd done for work last Fall, but there was still plenty to see. Sparrows enjoying a fountain made just to their liking in Central Park's Conservatory Garden. This afternoon I go for my post-treatment wrapup "survivorship" session with my oncologist. I do expect there will be follow-up appointments just to keep an eye on me, my understanding is that you're not considered to be truly out of the woods until there hasn't been a recurrence for 5 years, and there are some finishing touches to be done on Left Girl, but first I think I'm going to go have myself a good boaty swimmy hikey summer. "Survivorship" sounds so odd to me - my care team was amazing and I honestly never felt like I was in that much danger. They were awesome - "You've got cancer. But here's why everything's going to be OK." And then we did what we needed to do and some of it wasn't much fun, but mostly it wasn't too bad, and I do believe that they were right. I feel good. Baker's dozen from a quick first look at the day's photos. Click on the first photo for a slideshow view, too late to say much more except that it was a pretty darned cool way to spend the afternoon! I wanted to let you know about an event that I'm working on for this coming Friday, with the help of Noah at the Brooklyn Bridge Boathouse. Sorry about the short notice, this all happened pretty fast! 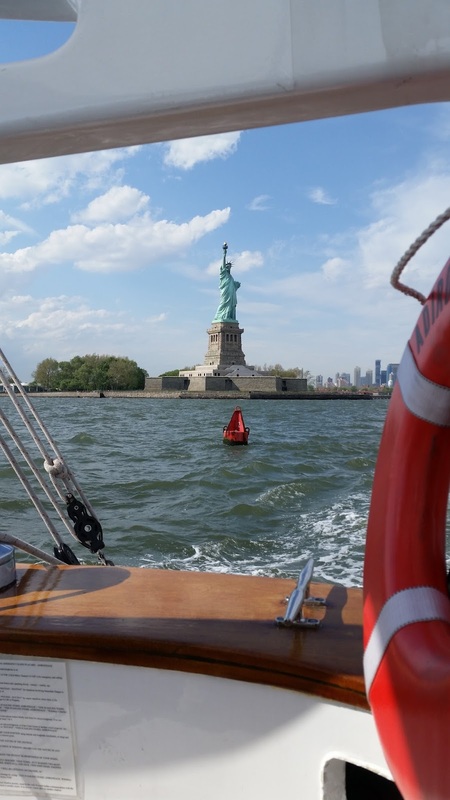 If you've been following Frogma for any time at all, you are probably aware the upcoming June visit to NYC of the Polynesian voyaging canoe Hokule'a. This 40 year old performance-accurate replica of a traditional Hawaiian sailing wa'a has been traveling around the world using traditional Polynesian wayfinding techniques - no compass, no GPS, just stars, currents, wave patterns, birds, clouds, etc. Hokule'a was a VERY big deal when I was a kid in Hawaii, so I just about fell off of my chair when I found out she was coming here. She'll be here in early June, and as one of the leadup events, I'll be showing Sam Low's The Navigators, a fantastic documentary about how the wayfinding skills, although fading away in the 70's, were still very actively in use in the Caroline Islands, and how the partnership between the dreamers and builders and first sailors of the Hokule'a, and one of the last of the traditionally trained navigators, Mau Piailug, first began. We'll also have an update from 2015 showing some highlights from the current voyage (Hokule'a has sailed many many miles since she was launched, but right around this time last year, when she left New Zealand and sailed for Australia, was the first time she'd ever left her Pacific home waters), and we'll be joined by Mahina Richards, who was a crew member aboard Hokule'a during the 2014 leg (Pacific) of the Malama Honua voyage, and she'll be telling us a little about what it's like be out there on the wa'a, and participating in a Q and A. This should be a very good evening! Friday the 6th (coming right up here); space is somewhat limited so RSVP's would be greatly appreciated! Please feel free to spread the word, this should be a fun evening! For Mahina's favorite blog post from her time aboard, click here. Thank you to the Brooklyn Bridge Park, Brooklyn Bridge Park Boathouse, and Halawai for all the help in setting this up!